Yes, it’s that time again – every two months the “STIA” meets to coordinate the progress on the development of the Salmonberry Trail. It was all so easy and romantic when it was just a few of us dreaming about what a tremendous hike the rail bed of the PR&N railroad would make along the bottom of the Salmonberry River canyon. Of course, we hoped that the state would get involved to build this mega-trail project. And fortunately there were many others that shared similar visions, including the Governor’s office, the leadership of the Department of Forestry, the management of the Oregon Parks and Recreation Department (OPRD), the owners of the Port of Tillamook Bay, Cycle Oregon, and several local politicians including Senator Betsy Johnson. Port of Tillamook Mess Hall – location of the December 2nd STIA meeting. But with the involvement of the state, the project suddenly got immensely more complicated. Rights of way had to be established, development restrictions had to be identified, the Surface Transportation Board (STB) had to be informed, and the funding and planning for the project had to be established. For the first six months the nascent intergovernmental agency at the core of the project was almost completely occupied with an ever widening list of “to do’s”. Every meeting of the STIA revealed more organizational infrastructure that needed to be established before the route could be made accessible. Now that the Department of Forestry (ODF) and the Oregon Park and Recreation Department (OPRD) were leading the charge it became apparent what a multi-layered, long-term challenge this project was going to be. The meeting of the STIA was well attended by the major local and state officials currently involved in the project. Administrative matters, such a board member insurance, took up some of the agenda, but the real “meat” of the meeting came with Jack Mulder’s assessment of the development costs for the Mohler to Tillamook segment, and the announcement that the Salmonberry Trail project’s budget package had been turned down by the Governor, and there was no future funding identified to continue the administrative functions of this project. Those sobering considerations aside, the leadership recommitted itself to the continuation and long-terms success of the project. It’s been nearly a year since the “STIA” was formed and given authority to acquire the rights of way associated with the now defunct Pacific Railway and Navigation (PR&N). Already some of the key advocates are retiring. Doug Decker, the Director of the Department of Forestry has retired, and Peter Doughtrey, the new Director of ODF has replaced him on the intergovernmental agency. Mark Labhart, the Commissioner from Tillamook has also retired, effective as of this meeting. Much of the meeting was consumed with details about the “rail-banking” of the railway rights. It had been decided in earlier meetings that it was better to retain the right to restore rail service to this route, rather than relinquishing this right altogether. Although There were several tactical advantages to proceeding in this manner, but the process is nonetheless tortuously complex. Most of the progress had to do with defining and valuing the right of way. It also entailed the establishment of entities that had recognized claims on the rail-bed, or obligations that resulted from their ownership of this right of way. In the end the agency had to convince the Surface Transportation Board (STB) that STIA had inherited the rights and obligations associated with the so-called PR&N rail line. As a result of transferring the right of way to STIA, the STB was expected to approve the “rail-banking” designation and permit the establishment of a trail along the corridor. New logo for the trail introduced by Ross Holloway. Discussion of this was deferred to the next meeting, scheduled for February 2nd, in Banks. 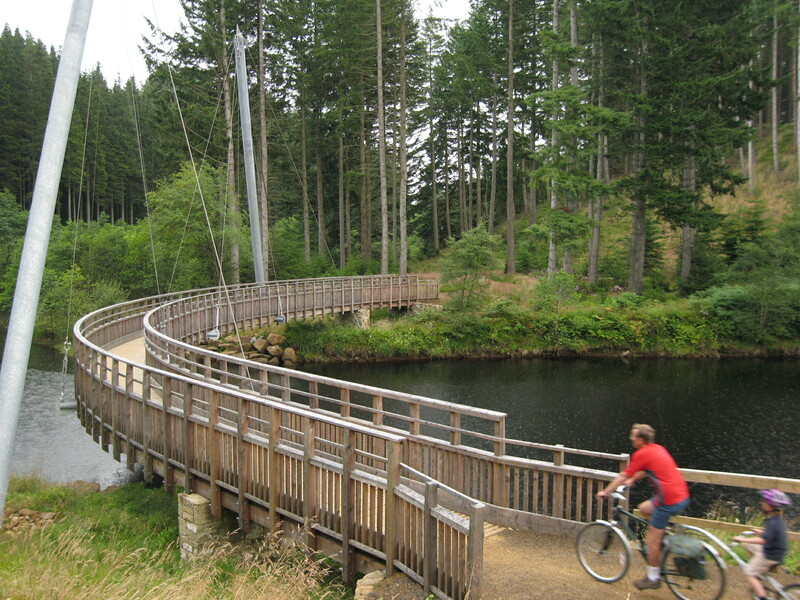 The estimated cost of building a trail alongside the railway from Mohler to Tillamook, excluding the costs of any bridges would amount to roughly $47, 520,000. However, between Mohler and Rockaway and south of Garibaldi there are approximately 7.5 miles where the trail lies next to an “Estuarial Natural Area”, which includes a strict prohibition any development. It was also determined that in those places where the route gets squeezed by the adjacent environmental restrictions, a cantilevering design will not work. Thus accommodating a trail in these protected areas would require building a parallel bridging structure comprised of concrete pylons topped by concrete slabs. The cost of building these structures and bridges explodes the cost way beyond the original estimate of $47.5 million. When you add in the cost of the 17 bridges between Mohler and Latimer Road the original estimate rises to an estimated $ 139 million. This equates to $300/ft. or $2 million/mile. Both options are financially out of reach at present. So the plan is to focus efforts on specific segments that can provide immediate local value, such as in Rockaway, Bay City and Garibaldi where building a parallel trail is not expensive and there is an immediate benefit for the communities. The Coastal Segment survey also established that the rail-to-trail (R2T) design option would produce only a narrow 8 ft. wide trail. On the other hand, a rails-with-trail (RWT) option would support a 12′ wide trail with 2′ gravel shoulders. But this involved nearly doubling the footprint of the route. Over the past few months the Governor’s office has collected the proposed 2017-2019 budgets (http://www.oregon.gov/das/Financial/Documents/2017-19_gb.pdf) from all its agencies. The Governor’s office then sifted through them to approve or reject specific items included in the agency requests. One of those discrete budgetary packages included the Salmonberry Trail package, submitted by the Oregon Parks and Recreation Department. But Lisa Sumption, the Director of the OPRD, announced that it had been rejected. So at present there are no monies in the Governor’s budget for the Salmonberry Trail project despite ballooning costs on the coastal segment. Even the current single staffer for this project was not funded. In addition there was no funding for The Oregon Solutions team, that helped to “stand up” the current “STIA” entity, that developed the project’s strategic plan, and managed the day-to-day functioning of this project. No staffing and administrative help! How’s that going to work? Even though there was hand wringing by some of the Salmonberry Trail’s supporters, because the project hadn’t made it into the Governor’s 2017-2019 budget, there was a still resounding reaffirmation from STIA’s board to proceed forward with the project. During the Public Comment period, Jim Thayer (the writer of this blog), proposed that STIA should chronicle this project since it is likely to be significant both in terms of time and costs, but also in terms of delivering a very significant piece of recreational and economic development infrastructure. The author offered to work with key members of the project leadership to develop a proposal to chronicle the Salmonberry Trail project at its February 3rd meeting in Salem. Residents of the Timber area were also present and announced that they were trying to put together another local forum to discuss the impact of the canyon section of the trail on their community. Finally, a tragic occurrence highlights the dangers of going out on this trail. It seems that one family brought their dog and tried to cross the Big Baldwin. The dog slipped between two of the ties and fell 180′ to his death. So, please be cautious and avoid the trestles!